Basically, promotional products can bring a brand to life. How is that? You may ask. Well, in business, a brand that is unknown to the public doesn’t exist. A survey conducted recently by the Promotional Products Association International (PPAI) resulted in useful insights. Such insights will help you have a better idea of the power that promotional business has in creating brand awareness. People who receive a promotional item had a favorable reaction to the company who gave it to them. This means that if you give people a promotional product it’s very likely that they will look at your brand through positive eyes. “Nearly half of the respondents to the survey said that they were either somewhat more or significantly more receptive to a company and its message as a result of the promotional item.”(*) This is gold! This means that a promotional product acts as a potential door opening for gaining new customers. The more useful an item, the more valued it is. We will talk in more detail about this specific point in another article. However, it’s important to keep this in mind because you want your brand to be perceived as a brand that offers solutions and that cares about its customers’ needs. And you can achieve this with a useful promotional product. Even items perceived as less expensive had a positive response from recipients. Beautiful! This means that you can create a positive experience around your brand without having to spend a fortune. Summing up, promotional products are very powerful tools to create visibility (also called brand awareness), which is the first step to make your business grow. 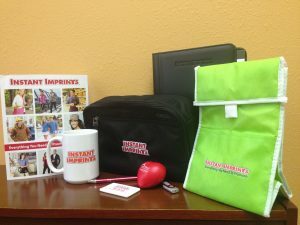 I invite you to watch the video below to learn how Instant Imprints can support your brand to stand out.